The End of Love stands out above the rest because of the spectacular acting performances between the father and son. 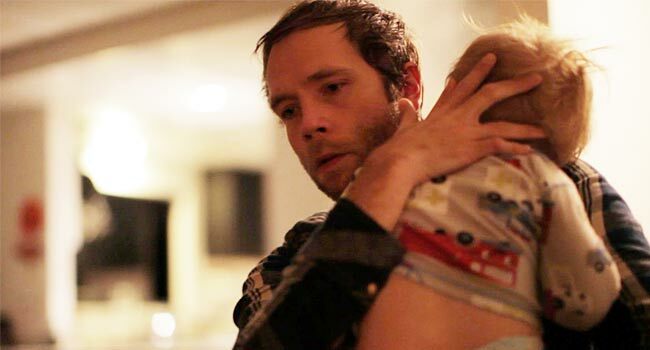 Mark Webber’s sophomore effort as a director, The End of Love, follows a jobless single-father who is struggling to make ends meet while caring for his son. The film feels incredibly personal to Webber as nearly everyone in the cast goes by their real name and his son in the film is played be his actual child. It is the type of film that we come to expect out of Sundance Film Festival, a realistic portrait of an aspiring artist with an attempt to tug at your heartstrings. Although it does not venture far from that “Sundance formula”, The End of Love stands out above the rest because of the spectacular acting performances between the father and son. Mark (Mark Webber), clearly exhausted, pleads with his two-year-old son Isaac (Isaac Love) to go back to sleep for just five more minutes. Because Mark is a single-father and can barely make his rent payments, paying for daycare every day is out of the question. Therefore, Mark is forced to bring Isaac along everywhere he goes, including his acting auditions that turn disastrous because of it. With his roommates on his back about paying rent, life delivers a knockout punch when his car is towed, setting him back half a grand. Just as things could not get any worse for the struggling father and adorable son, a bone is thrown in their direction. Mark ends up meeting a lovely woman (Shannyn Sossamon) who is not only a single parent herself, but runs an indoor playground for children. You can tell his dating skills are rusty when she must make all the first moves, but the real kicker is when he tries to advance the relationship on the first date. This is painful to witness because you cannot help but feel remorse for him. And it is not the last time he makes the mistake. Without question what makes The End of Love so moving is the empathy we feel for Mark and Isaac. The dynamic between the two is incredibly intimate because they are actually father and son in real life. This means the youngster did not need to recite lines and had the freedom to be his natural youthful self. Results of this improvised approach pays dividends in the long run by making the whole production seem exceptionally realistic. Serving as a great contrast to the broke wannabe actor are the onslaught of cameos made by Amanda Seyfried, Jason Ritter, Aubrey Plaza, Jake Johnson, and Michael Cera, all basically playing themselves as highly successful people in Hollywood. The unfortunate part is their success in the field gives Mark false illusions that he is close to achieving the same. But this is not a pity party for Webber’s character. The ratio between the audience feeling bad for him and despising him for doing something irresponsible is close to a one to one match. Perhaps even worse than an ending that is wholly upbeat or devastatingly depressing is one that takes the middle of the road, and unfortunately that is where The End of Love lands. There is a sense that the lead character is finally coming to terms with his wife’s passing, but leaves enough unanswered to make the audience neither cheer nor weep. Unlike the rest of the film where emotions are heightened, the ending is much more complacent. In the grand scheme of it all, this is a fairly minor quibble in an otherwise notable character study about coming to terms with difficult situations.